The Philips CX50 ultrasound machine employs powerful Xtreme x Matrix technology, making it the premier cardiac ultrasound system available on the market today. Designed for premium adult and pediatric echocardiography, this compact system also boasts surgical and interventional procedures. It ensures diagnostic excellence along with ease of use, all within a lightweight, tightly constructed package. 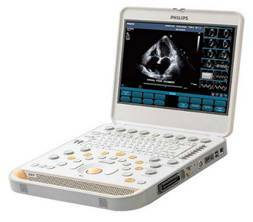 The durable Philips CX50 ultrasound machine offers migration of the iE33 xMatrix system; premium stress echo imaging; and live 3D TEE and EchoNavigator technology. In addition, it employs cutting-edge iScan technology, which uses one simple button to adjust all scanning parameters with stored parameter for quick and easy optimization. SmartExam technology saves imaging protocols for reduced keystrokes and consistency when saving images, and Philips gives this machine a clear edge over its competitors with premier echocardiography quantification tools, including SQ- Strain, and IMT for vascular intimal thickening.